In behavioral modeling sequential execution statements are used. The statements used in this modeling style allowed only inside PROCESSES, FUNCTIONS, or PROCEDURES. Describing a circuit at the behavioral level is very similar to writing a computer program. You have all the standard high-level programming language constructs (like C, BASIC), such as the FOR LOOP, WHILE LOOP, IF THEN ELSE, CASE, and variable assignments. The statements are enclosed in a PROCESS block, and are executed sequentially. When creating a behavioral description of a circuit, you will describe your circuit in terms of its operation over time. Let us take the example of simple NAND2 logic gate as shown in following Fig.4.9.1. In behavioral modeling we must require the behavior of design or simply truth table of design. No need of logical circuit diagram. 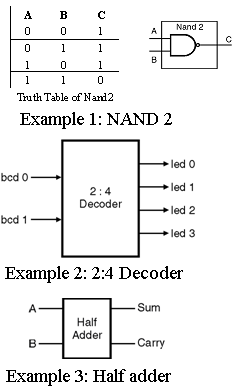 Example 1 : Example of Behavioral style architecture for Entity NAND2. when "00" => S <= "0001"
when "01" => S <= "0010"
when "10" => S <= "0100"
when "11" => S <= "1000"